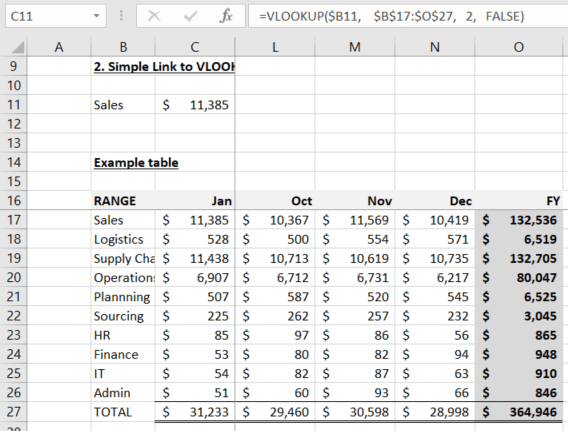 It can be incredibly useful to create a link to VLOOKUP results in Excel®. This is particularly true if you have used VLOOKUP to join data from one table to another. 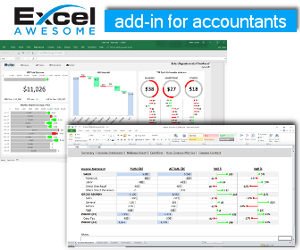 You can jump straight to the result of the VLOOKUP and see the rest of the data in that row of your Excel® table. We can quite easily create the join by using the HYPERLINK, ADDRESS and MATCH functions along with the VLOOKUP. Then with a slightly different solution we can make the formula more robust so it won’t be disrupted by changes to the worksheet name. This tutorial assumes you are familiar with the VLOOKUP function. Note: our special links tools can create these links to VLOOKUP results in seconds or click Downloads above for the free trial of all the tools. The HYPERLINK function is less often used so lets start with that. HYPERLINK requires two arguments. The first is the LINK_LOCATION. I.e. the web address or in our case the file, sheet and cell address that Excel® will jump to when the link is clicked. Note the format of the LINK_LOCATION if you need to use the full path. The full location is in inverted commas “”. Within this the folder path and file name are contained in  square brackets. The sheet name is within single inverted commas ‘. Then exclamation mark “!” is required prior to the cell reference. The FRIENDLY_NAME can be any text you like. Clearly if we are just linking to the current file it would be good if we could avoid the text for the path and filename. Particularly if there is a chance these could change. Thankfully Microsoft® provide a simple solution to this. This is a lot tidier and more functional as a change to file path or name will not affect the function. Now we’ve looked at the HYPERLINK function lets start our link to the VLOOKUP result. So this is returning our January figure for ‘Sales’. The address used in our link to the result will need to be dynamic. I.e. when cell B11 changes from Operations to Sourcing the address will need to change from $C$20 to $C$22. The ADDRESS function in Excel® requires the following arguments: ROW_NUM, COL_NUM. There are also the following optional arguments which we won’t need for now: ABS_NUM, A1, and SHEET NAME. We’ll use cell C11 to develop our ADDRESS function for now. To calculate the row number for the address we can do the following calculation: [the first row of our lookup table] + [the row in the table where we can find the VLOOKUP result]. The ROW formula will simply return 17 as being the start of our table. The MATCH function will look down the first column of our table and return the number position of the matched item. For ‘Operations’ this will be 4. 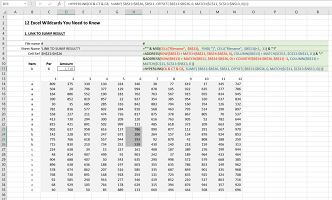 This will work whenever the lookup table is in the same sheet as our formula. This can be easily adapted so we can copy it to a different sheet (it still needs to be in the same file). Notice we can still ignore the other optional arguments in the ADDRESS function (hence the 3 commas together between the COL_NUM and the SHEET_NAME). This Excel® link to the VLOOKUP result should work really well for most occasions. We could run in to problems if the worksheet with the lookup table is renamed. As you can see in our formula, the sheet name has been hard-coded. We can overcome the sheet name problem by using the CELL function. =CELL(“filename”, ‘LINK TO VLOOKUP RESULT’!$C$17). This will return the full path, filename and sheet name: C:\Users\Mike\Desktop\[Excel Awesome Tutorials 20180323.xlsx]LINK TO VLOOKUP RESULT (where “LINK TO VLOOKUP RESULT” is the sheet name we want). You can see from the result that we could use the string after the close square bracket ‘]’ to identify the sheet name. Finally we can use the MID function to just take the final characters. The MID function arguments are: TEXT, START_NUM, NUM_OF_CHARACTERS. The text will be our CELL function, start will be our FIND function and the number of characters just needs to be long enough to pick up any sheet name (it doesn’t matter if this number is larger than the remaining text). The maximum sheet name length in Excel® is 31 characters. We can now go back to our HYPERLINK formula. Within that formula, locate the sheet name in the ADDRESS function. Now replace the hard-coded sheet name with the MID function we’ve just developed (see Fig(a6) below). If you want to go on to look at a similar exercise then the last part of this tutorial looks at links to SUMIF results. We can use similar functionality with SUMIF formulas. This is going to take things a step further. But this is probably even more useful as we’re going to be able to jump to a whole range of data that meets the SUMIF criteria. This does require the SUMIF criteria range to be sorted. We’re going to have a dynamic SUMIF function in this example. This looks in the appropriate month column in our table. So if we select ‘1’ we get January results; if we select ‘2’ we get February results and so on. Before we look at the link lets first consider how we can build the dynamic function with SUMIF. Lets start by reviewing the SUMIF function used in the case. SUMIF arguments are: CRITERIA_RANGE, CRITERIA and SUM_RANGE. Our criteria range is $B$13:$B$36. In here we’re looking for the value in cell B11. Our sum range is the dynamic part of the SUMIF: we’re going to set the column to sum from our table based on the entry in cell C11. This dynamic function is achieved by using the OFFSET function. OFFSET arguments are REFERENCE, ROWS, COLUMNS, [HEIGHT] and [WIDTH]. We don’t need to worry about the final two optional arguments on this occasion. Our reference is the same as the SUMIF criteria range (B13:B36). We’re going to use this as the basis for our for our dynamic range. The rows number will shift our reference range either up or down based on this value. We won’t be moving the rows of the range so our ROWS value will be zero. Now we have our dynamic SUMIF function we can start to develop the link to result function. As the formula is even longer in this instance we’ve kept the filename, sheet name and address functions separate in cells C6:C8. The filename and sheet names are identified in the same way as the link to VLOOKUP result earlier in this page. The address is slightly more complicated as we have to identify the top left cell and the bottom right cell of the range in the HYPERLINK. As you can see in the image below, the formula in cell C8 is shown in cell I8 for information. There are 2 address functions for top left and bottom right joined by “:”. We now have all the components needed for the final formula. The link address is now in cells C6:C8. We just need to join these as the HYPERLINK LOCATION_ADDRESS and use the dynamic SUMIF calculation as the FRIENDLY_NAME. There is a little work to put this together the first time. 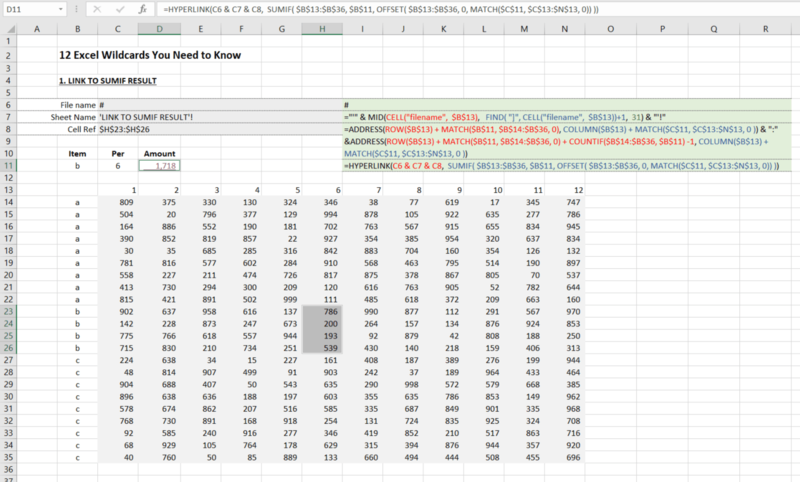 But the result will be worth it when you (or your spreadsheet users) need to drill down to details. Learn more about VLOOKUP: Lookup Part of Text in a Cell.